We talk a lot at SOIL about increasing access to sanitation in Haiti. We’re hard at work to expand our programs every day as we work to build a city-wide sanitation service in a country where 75% of people lack access to a toilet. But what does it mean to build a service that’s truly accessible? As we work to expand our EkoLakay service into new homes and new neighborhoods in the years to come, we’re also thinking about expanding access in a different way. For people with different levels of physical ability, making your way to a room far from your bed to use the restroom can be a huge challenge. 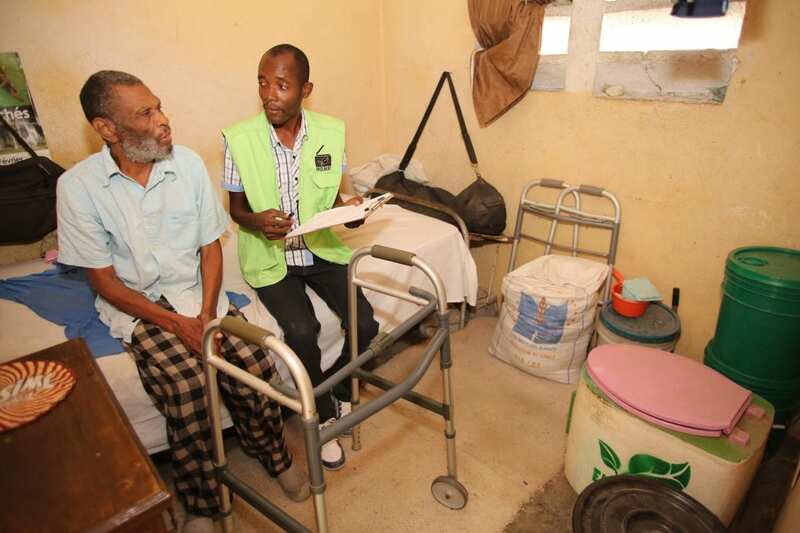 With that in mind, SOIL designed a toilet that could be portable, so that people like Jean Nelson, who has a physical disability constraining his mobility, are able to install it directly in their bedroom. Jean Nelson told us that this is one of the primary reasons that he decided to join SOIL’s service in Port-au-Prince. Our weekly collection service helps, too. Every week a SOIL team member passes by each and every house to collect full containers of waste and provide clean containers of carbon cover material, making maintenance easier for clients of all abilities. The design of SOIL’s household toilets and maintenance service has undergone an iterative process throughout the years. By working closely and intentionally alongside members of the communities we serve, SOIL is proud to have designed a sanitation solution that meets the needs of our customers and is more accessible to people with disabilities than traditional systems. And we’re not done! We continue to partner with both local communities and sanitation researchers across the world to gather feedback and adapt our model to make it the best it can be. Follow this link to read about SOIL’s ambitious plans for the years to come and don’t miss our latest annual report here. No Replies to "Making Sanitation Accessible"